My first strong memory of Woody Allen was in December 1997 while I was in college. Olga and I had been dating for almost a year, Deconstructing Harry was released, and we went to see it in the theatre. People were saying it wasn't his best work, but I enjoyed the film. It was certainly wittier than most of the other movies I had seen up to that point in my life. I've been defending Woody Allen ever since. Two years later, having watched a lot of his back catalogue, I decided to send Woody a Hanukkah card. He had just released Sweet and Lowdown - one of his best films to date. I was living in a small apartment near Boston, about to ask Olga to marry me. In the card, I sent warm greetings to Woody's family, congratulations on the film, stuff like that. It didn't take much effort to track down his mailing address using Yahoo or Altavista. The next year, now engaged to Olga and living in a big apartment near Boston, I sent Woody Allen another Hanukkah card. He seemed to be having a difficult year, heading into a nasty legal battle with his former business partner, and having trouble getting financing for his films. The following year, Olga and I got married. After 9/11, Woody reached out to directors asking them to support filmmaking in New York City. I connected with Woody and his mission in the annual Hanukkah card. The subsequent year, I had purchased Woody Allen's footrest at the liquidation auction of his defunct production company's prop warehouse. Of course I thanked him for the many hours of relaxing foot elevation. By then, the tradition had stuck. Any year that the card came back return to sender, I would research the production companies of his current projects and keep resending the card until it stopped coming back. One year I sent it a total of three times. 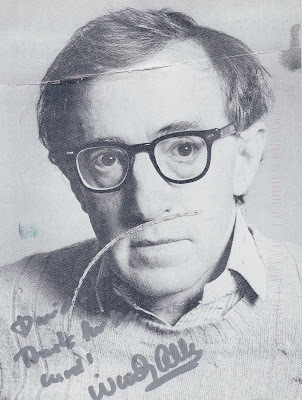 Last week, I opened my mailbox, and to my absolute astonishment, crumpled up between some junk mail, there was a picture postcard of Woody Allen. Why now, after 12 years, did Woody write back? Is it because he's so excited after achieving his highest grossing film of all time? Or maybe he was so touched by my note about our winter vacation plans and enjoyment of his audiobook collection. The world may never know! Or maybe this is the start of a wonderful friendship. You know Oprah took her most loyal fans to Australia -- who know where you & Woody might go? First you have to send Oprah a Hanukkah card! Good stuff David! I've read that many lasting friendships have started this way. David, David, David, why didn't you ask him this burning question (when you were stalking him)? He was a little preoccupied!